It doesn't get much more beautiful than our range of exclusive, best-selling Melbourne Gift Hampers. For over a decade we've been sourcing the world's most delicious artisan produce, pairing it with the world's most loved Champagne, award-winning wine, whisky and of course luxurious pampering products to create gift hampers that Melburnians have simply adored receiving. There's a reason we're the most popular Melbourne hamper company - because we've put smiles on the faces of over 200,000 happy customers, and we continue to create smiles Australia-wide every single day. Wondering Why We’re Melbourne’s Favourite Hamper Company? If you’re looking for the perfect gift for Melbourne friends and family, or perhaps a special treat for yourself, we’re here to give you the best news you’ve read… ever! You’ve just found Melbourne’s favourite Hamper Company, and not only have we got a beautiful selection of gourmet and luxury gifts for every occasion, but all our hampers also include FREE Delivery! 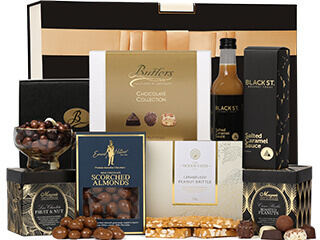 For over a decade we’ve been sending Australia’s most luxurious gift hampers right across the country, and when it comes to our best-selling Melbourne Hampers, oh boy do we have just the treat. 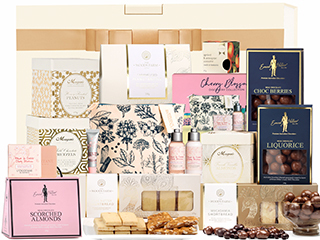 You won’t find boring supermarket brands inside our luxury hampers, we’ve searched the world over for the finest gourmet flavours, the most luxurious skincare and treats, because when we send gift hampers across Melbourne, we’ll always make sure they’ll bring a smile to their lucky recipient. 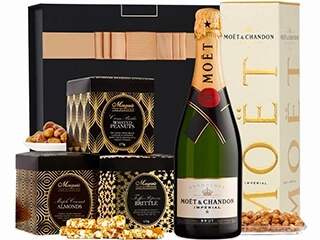 Through years of sourcing only the best products, creating our own luxury gift hamper packaging and having a close relationship with our customers, we've refined our Melbourne Hampers to have you covered for all occasions, including Christmas, birthday, anniversary and corporate celebration hampers. We know how to impress even the fussiest of recipients, let us do the hard work for you and deliver a Melbourne hamper that has been curated with gourmet foods, indulgent beverages and the finest luxury goods. When we deliver on behalf of a person, we make sure every detail is as perfect as can be. All of our hampers are perfectly presented at an affordable price. 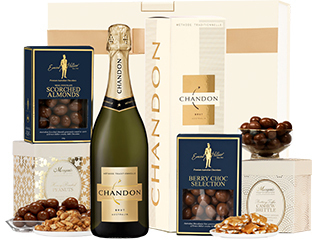 We offer hampers and gift baskets with Australia wide delivery. When it comes to hampers and gift baskets, don't waste time with boring products that can be found in the supermarket, we know you're looking to impress your recipient and leave them feeling loved and just a little (or a lot) spoilt, so even on your most busy day, simply browse our available Melbourne gift range and we're sure you'll find the perfect match for every occasion with The Hamper Emporium. Melbourne is a city of fun and style, and with friends and family surrounded by so much awesomeness - the beauty of the city and it’s natural surrounds – what do you choose as a gift for special occasions? Well, one thing we know about Melburnians is that they love quality and luxury, which means they absolutely adore our gift hampers. The feedback we’ve had from our customers over the last decade is that choosing the perfect gift can often feel overwhelming. Again and again, our gift hamper customers tell us that their favourite part of ordering a gift hamper is that they know, not only will it arrive beautifully presented in our keepsake luxury gift box, but it will be packed full of world-class brands that impress their gift recipients, and that’s exactly what we love the most about what we do! 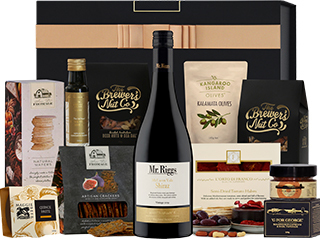 We’ve worked with exclusive suppliers from amazing Australian artisan food producers, and some of the most fabulous world-renowned brands to create exclusive gift hampers that are guaranteed to impress every time. By choosing a gift hamper from The Hamper Emporium, you’re guaranteed quality, luxury and a smile with each delivery. What Are The Best-Selling Melbourne Gift Hampers? 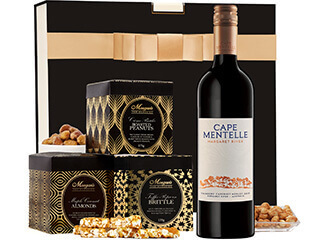 No matter what the occasion, or what recipient you have in mind, our best-selling Melbourne gift hampers are suitable for a wide range of recipients. From Wine Hampers to Australian Beer Hampers, right through to luxurious Pamper Hampers, we've got a beautiful selection that our Melbourne gift recipients truly love. 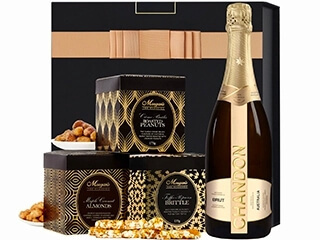 Beautiful Sparkling Wine from Chandon, in our Chandon Celebration Hamper, Glenmorangie 10 Year Original With Whisky Tumblers, The Classic Port Hamper, or perhaps our L'Occitane Pamper Hamper, no matter what the recipient you have in mind, we have the perfect gift for them. What's In The Hamper Emporium Beers of Australia Hamper? When we talk about hampers men in Melbourne love, we certainly have to mention this bestseller from our range of top hampers. 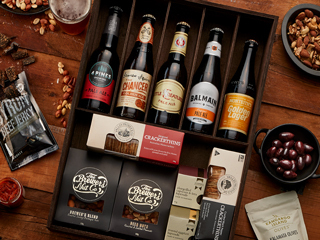 The Beers of Australia Hamper contains beers from some of the best craft beer breweries in the country; each with its own unique flavour and finish. We've searched across the country and tried a huge number of beers, and chosen only the best, including Monteith’s brewery, Little Creatures, James Squire, Balmain and the Mildura Brewery. A great beer hamper also needs a generous amount of snacks, so our hamper designer has been mindful to include the perfect snacks to complement the beers in this hamper well. 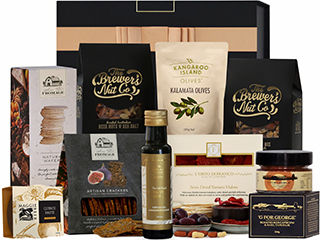 Inside the beers of Australia hamper, customers will find the premium nibbles brewer’s blend, BBQ peanuts, plain lavash, beef jerky, chips and sundried tomato tapenade. 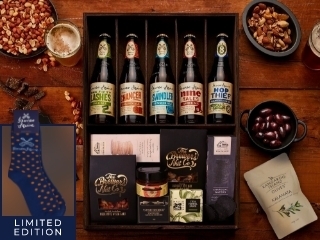 We know Melbourne loves craft beers, so we're sure that your lucky Melbourne friends and family will adore receiving this gorgeous best-selling beer hamper to help them celebrate in style. Are Christmas Hampers Available For Express Delivery In Melbourne? Sending hampers across Australia is something we love, but if we're honest, our favourite hampers are Christmas gift hampers, and we're as proud as can be to send the joy of Christmas to your friends, family and loved ones across Melbourne. We offer a beautiful range of Christmas Hampers that are exclusively available for the festive season, and while all of our hampers are suitable for gifting all year round, including Xmas time, if you're after an additional touch of festivities then our Melbourne Christmas Hampers will be just the thing. Inside our Christmas hampers, you'll find goodies such as gourmet nibbles from brands such as Morgan's, Kangaroo Island Produce, and The Wood's Farm, all mouth-watering, and all created by amazing Australian producers. Our Xmas hampers are delivered in our luxury gift boxes and include a personalised free Christmas card so that you can send a special message with your Christmas gift box. Our entire range includes free standard delivery across Australia, but we also offer upgraded delivery options for express delivery too. We always recommend leaving plenty of time for your parcel to arrive, especially during busy times such as Christmas, but we'll do our very best to get last minute hampers to their destination too. Can I Use One of the Melbourne Hampers as a Thank You Hamper? 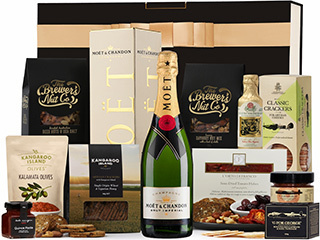 Any of our Melbourne hampers are the perfect option to send as a thank you hamper. Many of our gift baskets can be used for various special occasions, so chances are you'll find a suitable thank you hamper in our Melbourne hampers collection, and if not, take a look at our entire hamper range to find an even wider selection that's filled with options for all tastes and budgets. Other categories on the Hamper Emporium website include our Sydney and Brisbane hamper sections, along with our baby hamper selection, our pamper gifts and a range of corporate gift ideas for business customers. 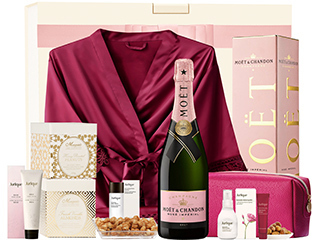 So, we're confident that whether it's a thank you hamper, a welcome to the world newborn hamper, a birthday hamper for women, or a personalised gift hamper for men, there's something special available within your budget, and we guarantee that each and every gift hamper includes only the highest quality range of gifts in Australia. What Other Special Occasions Are Melbourne Hampers Suitable for? Even though our selection of Melbourne hampers are showcased for being our best-selling gifts range ordered with Melbourne residents in mind, you can use them throughout the country and for any special occasion. When you look at our range of hampers for other Australian areas, you will see that they can be quite similar. So, if you are shopping for a resident in Sydney, but would love to use a hamper from the Melbourne category, there is nothing stopping you! Do you want more info on our Melbourne hampers? Or need some recommendations for a special occasion your Melbourne resident is celebrating? Get in touch with the Hamper Emporium team for advice.